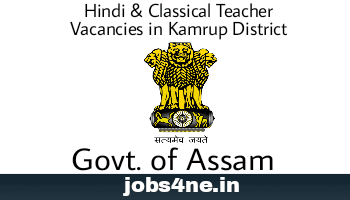 Hindi & Classical Teacher (Arabic & Sanskrit) Vacancies in High/ HS Schools under Kamrup District Circle. - Jobs4NE : Jobs in Assam and North East India. Hindi & Classical Teacher (Arabic & Sanskrit) Vacancies in High/ HS Schools under Kamrup District Circle. Application are invited in Prescribe Format from the intending & eligible candidates for the 1(One) number of Classical Teacher (Sanskrit) post, 2(Two) number of Classical Teacher (Arabic) and 16 (Sixteen) number of Hindi Teacher posts lying vacant in the following Provincialised High/ Higher Secondary Schools under Kamrup District Circle, Amingaon. Last date for receipting of application: 27-06-2017. Name & Address of the School: Pachgaon H.S.School, Vill & P.O. : Geruah, Pin No.:781102. Name & Address of the School: Karara Patidarang High Madrassa, VIII:Outala, P.O. :Saledal, Pin: 781121, Kamrup (R). 3. Hindi Teacher: 2 ST(P)-1, 1 ST(H)-1. Name & Address of the School: Barigog Hajo H.S.School, Vill & P.O. : Kshudra Dumi, Pin: 781382, Kamrup (R). 4. Hindi Teacher: 1 ST(P). Name & Address of the School: Shrihati Bathan High School,Vill: Bathan, P.O. : Srihati Bathan, Kamrup (R). 5. Hindi Teacher: 1 ST(H). Name & Address of the School: Jawaharjyoti H.S. School, ViII: Kandukona, P.O. : Puthimari, Pin: 781380,Kamrup (R). 6. Hindi Teacher: 1 ST(P). Name & Address of the School: Bezera H.S.School, Vill & P.O. : Bezera, Pin: 781121, Kamrup (R). 7. Hindi Teacher: 1 ST(P). Name & Address of the School: Bijuli Nagar Bani Vidyapith H.S., P.O. : Rangia. 8 Hindi Teacher: 1 ST(P). Name & Address of the School: Mandakata High School, P.O. : Mandakata, Pin: 781121. 9. Hindi Teacher: 1 ST(P). Name & Address of the School: Pub Kamrup High School,Vill: Malibari, P.O. : Haldha, Pin: 781121. 10. Hindi Teacher: 1 ST(P). Name & Address of the School: Bonashar H.S. School, Vill & P.O. : Bongshar, Pin: 781103, Kamrup (R). 11. Hindi Teacher: 1 SC. Name & Address of the School: Simina Anchalik High School, P.O. : Simina, Pin: 781122. 12. Hindi Teacher: 1 ST(P). Name & Address of the School: Patrapukhuripar High School, P.O. : Baranghati, Pin: 781350. 13. Hindi Teacher: 1 SC. Name & Address of the School: Singerpara Patidarang High School, P.O. : Kendua, Vill: Bezera, Pln: 781121. 14 Hindi Teacher: 1 SC. Name & Address of the School: Kulshi Janajatiya High School, P.O. : Kulshi, Pin:781125, Kamrup (R). 15 Hindi Teacher: 1 SC. Name & Address of the School: Panitema Satgaon High School, Vill & P.O. :Panitema, Kamrup (R). 16. Classical Teacher (Arabic): 1 ST(P). Name & Address of the School: Pub Rangia High School, Kekenikuchi, Maranjana, Rangia, Kamrup (R). 17. Classical Teacher (Arabic): 1 OBC/MOBC. Name & Address of the School: Dorakahara High School, Dorakahaara, Pin: 781101. 18. Classical Teacher (Sanskrit): 1 ST(P). Name & Address of the School: Bongshar H.S. School, Vill & P.O. Bongshar, Pin: 781103, Kamrup (R). For the Hindi Post: Prabin/ Ratna with 50% marks having degree qualification from any recognized University or BA with Hindi as one of the subjects with 50% marks and BT/ B.Ed. degree from any recognized University along with TET Qualification. Upper age relaxation is applicable as per existing Govt. norms. For the Classical Teacher ( Sanskrit)Post: Shastri with 50% marks having degree qualification from any recognized University or BA with Sanskrit as one of the subjects with 50% marks and BT/B.Ed. degree from any recognized University along with TET Qualification. Upper age relaxation is applicable as per existing Govt. norms. For the Classical Teacher (Arabic) Post: F.M. with 50% marks having degree qualification from any recognized University or BA with Classical Teacher (Arabic) as one of the subjects with 50% marks and BT/B.Ed. degree from any recognized University along with TET Qualification. Upper age relaxation is applicable as per existing Govt. norms. Scale of pay: Pay-Band- II, Rs. 14,000- 49,000/- + Grade Pay Rs. 8,700/- + other allowances. How to Apply: All the intending candidates are requested to submit their applications along with necessary academic/ professional particulars on before 27.06.2017 in the respective address of the school as shown above. The Date of interview will be notified in the Notice Board of the concerned schools.